What with PEGI ratings, review sites, adverts and the like, finding appropriate video games for kids is easier now than it’s ever been. But finding one they’ll enjoy playing? With trends moving on faster than you can say “Pikachu, I choose you!”, it can be harder than you might think. Luckily though, help is at hand, and we’ve rounded up the best Xbox One games for kids to help you decide what to treat them with when that next big celebration rolls around (or just because). With rip-roaring racing games, action-packed adventures, sandbox games and slapstick shoot-em-ups, there’s something for all kinds of players. Our best pick all-round is the Marvel Universe-set edition of the wildly successful LEGO video games, LEGO Marvel Superheroes 2, which is suitable for ages seven and over, and has a multiplayer option that’ll appeal to siblings of all ages. 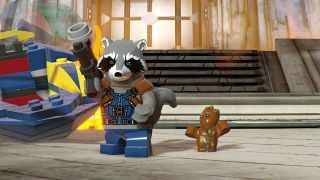 The LEGO games universe has something for every fandom from Star Wars to Lord of the Rings with a stop off at Hogwarts along the way, but the best of the bunch has to be LEGO Marvel Superheroes 2, which draws its inspiration, and its minifigures, from the Marvel Cinematic Universe. They can play as their favourite characters from the Avengers, Guardians of the Galaxy, Spider-Man and more, and cross timelines and story arcs for an adventure that’s enormous in its scope. Crucially, reviewers found that kids of different ages were brought together by this appealing game, making it a great multiplayer option for siblings to play together. The premise of Fortnite might sound violent, and… well, it is, but this bonkers battle royale in which players compete to be the last one standing has just the right dose of slapstick to keep it acceptable for older kids. It’s the biggest game in the world right now, and it’s not hard to see why: anyone with an Xbox Live Gold subscription can join in completely free, and play in real time with 99 others on one huge, colourful map, engaging in intense combat, developing skills, and – every pre-teen’s favourite pastime, it seems – destroying things around them. Chaotic, fast-paced, and often hilarious, it’s a great one for tweens and teens. With the ability to build worlds, go after resources, craft items and generally let their imaginations run wild, the low-res universe of Minecraft is a super addictive one that’s kept kids creating for years, so it’s no surprise the best selling game for Xbox 360 is back for Xbox One. Just as good for return players as new, Minecraft for Xbox One offers worlds up to 36 times larger, four-person multiplayer on-console or eight-person over Xbox Live, and the biggest range of downloadable content available for any console game. Plus, if your kid’s upgraded their console, they can transfer all of their progress from the previous game, which is a nice touch. Our best racing game for kids, Forza Horizon 3 is accessible, expansive, and looks gorgeous. Car-mad kids can get their kicks making millions of minute changes to their vehicles before they start, even down to the tyre pressure, while beginners and more casual fans can simply get straight into the action, if that’s what they prefer. That enormous scope translates to the map, too, and here it’s twice the size of the previous game’s, letting racers explore everything from jungle to beach to outback, as well as the usual tarmac. Sure, it’s a bit more high spec than the 2D version you might’ve pulled up in your browser all those years ago, but the charms of the original Plants vs. Zombies endure in this glitzy reimagining for Xbox One. Like its predecessor, it’s hilarious (Kernel Corn and Gnome Chomsky, anyone?) fast-paced and colourful, with single-player and multiplayer modes that rollick across a series fun maps, but no.2 adds some welcome new classes and abilities into the mix that’ll keep things fresh for return players, too. The customisation system also adds a layer of interest, allowing players to purchase anything from crazy hats to new twists on abilities with their hard-won in-game coin. We’d love to have been in the room the day “football, but with cars” was pitched to the execs at Warner Bros., but while it’s exactly as bonkers as it sounds, Rocket League has deservedly amassed a following of loyal fans. Most of them might be kids, but you’ll be dying to get in on the multiplayer action yourself when you see the wealth of gravity-defying moves the rocket-powered cars (playing in place of strikers and midfielders) can pull off. With its ability to custom design your vehicle, delightfully fast pace and the absence of any proper violence, it’s a solid bet for kids of all ages. Two appearances for Minecraft on the same list might seem like overkill, but while The Complete Adventure might operate in the same blocky universe as its wildly successful predecessor, it offers so many different virtues, even for return players. Story Mode is a little like a choose-your-own-ending book, wherein the people you encounter, what you say to them, and even how you say it has the ability to send the story veering off in a different direction, making for a tailored playing experience kids will love. Plus, it brings some long-overdue action to a much-loved universe, which is great in its own right.